Things I discover while coding. Using a combination of ColdFusion, ZXing, and JavaLoader you can create QR codes very easily. Simple QR creation with error correction using the ZXING library and javaloader. The ZXING library used will be influenced by the ColdFusion library CF8 = ZXING core 2.3.0. This was put together by following a few samples currently floating around, I was unable to find one that used the error correction however. I had worked on a past project ColdFusion project that required me to process large amounts of list data from a ColdFusion web service. Part of the process involved removing duplicates, which was using a cfloop to loop through the list. They had a limit to the amount they could process since this was a web service and taking too long to respond back to the calling server can cause some timeout issues. I was able to increase the amount that could be processed and increase performance by not not using a loop at all. I first created an array and then initiated the java HashSet object. I then converted my array to a java array, doing this will automatically remove the duplicates in the array. You can then create a list from this array. Simple, fast and no looping required. This is one of those things you learn about when you make a change on the wrong server, well at least that is how I learned about it and why I share it when someone else makes the same mistake. 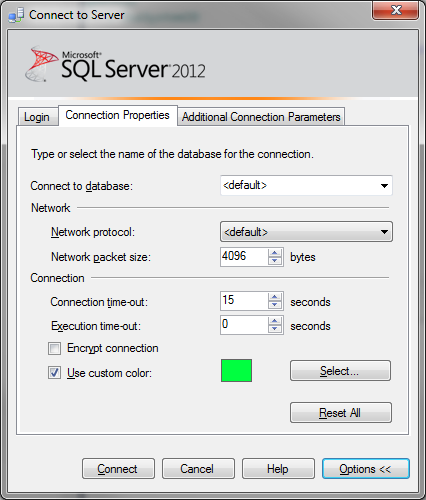 You can change the color of the status bar in Microsoft SQL Server Management Studio for every connection you make to help identify the server you are on. The first step is to launch the Connect To Server option. Then click on the "Options >>" button. Then check the "Use custom color" check box then the "Select" button to choose a color. I usually use Green for Development, Blue for Test and Red for Production. Hope this helps someone before they make a mistake on the wrong server, but sometimes we have to learn the hard way. I was trying to figure out an issue with the new project I took over, and found some ColdFusion code that was throwing some errors trying to parse XML that came from a Microsoft SQL Server stored procedure. The stored procedure was using the FOR XML RAW to output XML instead of the query output that is normally returned. I have not used this before so I am unaware of any limitations that may be involved. The error was being caused by the result set being truncated and failing the reading of the XML result. The results that were being returned was rather large but I am unsure why that would be an issue. I did read about some truncation but that was blamed on the SQL Server Management Studio and its limitations on the size of the result set it could return. The error I was receiving was being generated by ColdFusion so the SQL Server Management Studio limitations should not apply. 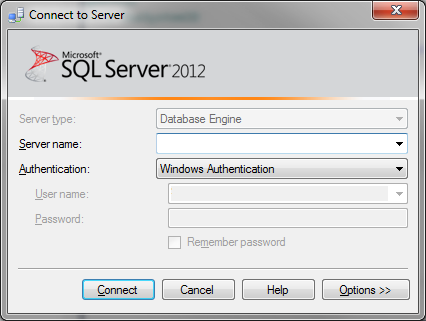 I did solve my issue by using the XML data type that is available in Microsoft SQL Server 2005. I have not run the above query as I am using a different table but the idea is there. I understand I could probably do something else but my knowledge of SQL is limited to the basic stuff, this works for me so I am using it until I discover a better solution. I have neglected this blog for so long, things that seemed important or interesting at the time change as we grow older. The one constant is my job I am a ColdFusion Developer and have been for a long time. So I decided to turn this blog into a place to share some interesting things I figure out as a developer that can maybe help out someone else and to help me keep track of them. Cold Fusion Web Developer with 9 years experience in the health-care industry currently living in Houston, TX. I love the challenge of creating web applications that have a greater focus on the end user experience, including meeting Section 508 accessibility standards. I also have a great passion for technology, from just toys to tools to make life easier.